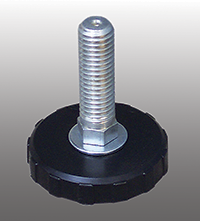 The IEC Poly Base Fixed Stud Metric leveler in steel and stainless steel offers metric threads and is ideal for medium-duty load requirements. The stud will tilt several degrees under load to compensate for unlevel surfaces. Cost-effective for applications not requiring a swivel base. Zinc plated steel stud and black polypropylene base. Four (4) base sizes to choose from (1” to 3”). Many sizes available with Top-A-JustTM top-end external hex (-HX). You may also request top broached hex, allen drive (-BR).